Palash Mahbub is a promising novelist, playwright, rhymist, and television programme-maker and host- all at once. Through his innate flair of writing, he has craved a special niche in the minds of Bengali bibliophiles. With a total of 36 books to his credit, the born author has been creating buzzes among bookworms of the country for over one and a half decades. The brilliant word wizard has found great name as a rhymist by weaving garlands of verses in a short span of his writing career. The versatile talent has recently opened up about his writing life with Md Enamul Hassan of daily sun. I am great and hope you are all doing fine. Yeas, I have so far gone to the fair six to seven times this year. Though I can’t go there every day due to my busy professional schedules, my mind is on the fair for all time. How is the fair going on? Generally, the fair is going great guns as bibliophiles are coming in large numbers to the fair this year. The ongoing fair seems to be well-arranged, spacious and dust-free. The publishers are also doing more business than ever. As the overall situation of the fair is better than that of any year before, it also works well for me in the same way. And the copies of my two or three books have already been sold out. Which books have you been brought out this time? I have put out a total of seven new books in the ongoing fair. However, three more books of mine have also been reprinted this year. Panjeree Publications has published Logic Labu, a juvenile novel, Tala, a story book, and Thokai Thokai Junak Jhole, a rhyming book, Anwesha Publication has printed To To Company O Birprateeker Madal, a juvenile novel of TO To Company series, Anya Prakash has brought out Suryamukhira Duibon, Tamralipi has put out Romeopathy, and Anindya Prokash has come up with Premano Kabya-2, the second book of Premanu series. Besides, Anindya Prokash has also reprinted Premanu Kabya-1, the first book of Premanu series, and Boi Khulle-e Bhut, and Panjeree has reprinted Piti Ratan Theke City Khokon, a juvenile novel. What’s the story behind To To Company series? I have actually named the series as To To Company to draw attention of younger generation of the country. The juvenile series is a bit of detective and adventure genre. A group of school students are seen playing detectives to solve a mystery in the novel. What’s the story behind Premanu Kabya series? The series has been named as such a name because it contains romantic poems in four lines at the very most. These poems are immensely popular among younger generation, especially lovebirds, of the country. Firstly, I write to express myself. Secondly, I take up pen in response to the eagerness of publishers and my valued readers. I started writing in my adolescence while I was a student of class eight in Chittagong. I first wrote for my school magazine and my write-up, that was a rhyme, was published in the magazine. Later on, I used to write and send them to different newspapers by post. And most of my write-ups were published that time. As a result, I got an inspiration for writing and continued writing in the later years as well. 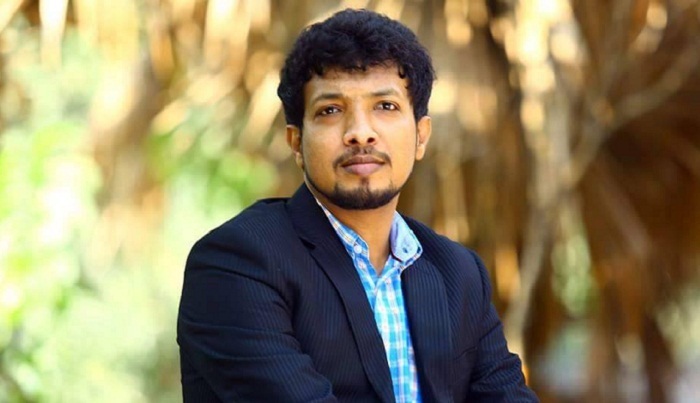 A few more years later, when I shifted to Dhaka and enrolled in the University of Dhaka, I took Journalism keeping my passion for writing in the mind, though I could choose any other subjects of the Faculty of Social Sciences of the university. My first published book is Pipilikar Pakha, a children’s book of rhymes. Jagriti Prokashoni brought out the title in 2000.
Who is your inspiration behind becoming a writer? I have derived inspiration from none. It is I who am my only source of inspiration in writing career. My family would support me while I was an amateur, but when they saw I was getting serious about writing, they used to discourage me for fear that my writing habit could harm my academic study. But they are now supporting me and even they collect my published write-ups that I can’t do. I actually believe in bringing about changes the names of my favourite writers from time to time. However, my favourite writers are Humayun Ahmed, Kazi Nazrul Islam, Rabindranath Tagore, Jibanananda Das, Thomas Hardy, Sunil Gangopadhyay, Samaresh Majumdar, Shirshendu Mukhopadhyay and Khushwant Singh. Which genre of literature do you enjoy more in? I firstly prefer novel and play. I have an innate tendency to write rhyme though. What do you think about Bengali literature? Bengali literature is very powerful as Bengali is the fourth most commonly spoken language in the world with over 200 million speakers. But Bengali literature is not in a good position in the international literary arena. In order to establish our literature on the global arena, we need arrange an international book fair every year so that our literature can reach other writers and readers across the world. It’s badly needed. What would you say for new writers? They have to read and write regularly without running out of patience. Because, the more that they read, the more things they can write. I would like to continue my writing for all time. I have also a dream of working in all genres of literature in the coming days. What would you say for your readers?